In this episode, the founders of Infinite Red—Jamon Holmgren, Ken Miller, and Todd Werth—are talking about Chain React, Infinite Red’s React Native tech conference this July 11-13th in Portland, OR. Hear the story of how the conference came about, how Infinite Red’s remote team worked together to create an in-person event, the value of hiring people with diverse interests and backgrounds, and all of the things that go into making the best conference possible. CHRIS MARTIN: In 2017, Infinite Red started Chain React, a conference devoted to React Native. So the question that I have for the three of you to start is: why start a conference and what was the need that you saw? JAMON HOLMGREN: This is Jamon and I was on Twitter and I was looking for a React Native conference because we had been doing React Native for about a year at that point. And I was thinking, well, it’d be really nice to see if some of our team could attend a conference and potentially maybe share some of the things that we had learned along the way. So I actually put out a tweet saying, “is there a React Native conference around? I’m not seeing one.” And got no responses, which partially had to do with my very small Twitter audience at the time and partially just because there wasn’t one. Now, it turns out there was one over in Europe, React Native EU, put on by our friends over at Callstack. TODD WERTH: But that was after. JAMON: I believe it was after that. KEN: We didn’t learn about that until after. TODD: Not at that time. JAMON: Right. I was just kinda chewing on that. Wow, I didn’t get any response to that. I would normally get two or three options if I were to put out something like that. And I woke up one morning, I’m like, you know what, maybe we should do a conference? And what is funny is independently two or three people contacted me after that, that same week saying, “Do you think we should do a React Native conference?” Just independently and it just seemed like that all kind of came together all at once. TODD: And this is Todd, Todd Werth, by the way. Some background here. We’ve never done a conference at all. We’ve of course all attended conferences. We’re familiar with that. Although Shawni Danner, who ran the conference had never attended a conference, which was funny, but anyways, so Jamon came up with the idea, talked to some other people in our company, they liked the idea and then pretty quickly we decided and then we started building the conference. KEN: …so he asked around various people to see whether they would speak. And I don’t remember if that was before we decided or after. I feel like that was before. We were kind of mulling the idea around and he was like, “hey, we’re thinking about doing this conference. Would you want to speak?” And when a bunch of people were like, yeah, hell yeah. We were like, okay, sounds like the stars are aligning, and it was very much a feeling of the stars aligning to be honest. KEN: This signal is kind of like once we started putting the idea out, it just gathered momentum from a bunch of different places and we’re like, okay, and then once you commit, the momentum increases. TODD: And as far as I know, it was the first React Native conference in the world. JAMON: As far as the first one that was held, I think Callstack announced their conference before we announced ours. But yeah it was right in that same time. TODD: Correct, they announced, but theirs came after ours actually. JAMON: Yeah, theirs was in September, ours was in July of 2017. CHRIS: So when you’re putting on a new venture, like a conference that you have no experience in and you start seeing the stars align and you start seeing this momentum form: how do you really go from zero to one? KEN: I don’t want to say it wasn’t hard because a lot of work went into it, but it wasn’t super difficult. At the end of the day, the hard part about making a conference is making a good conference. You get a venue, you get speakers, you get food, you get swag. I mean, I don’t mean to oversimplify it, but if you’ve planned a wedding, you can plan a conference, right? It’s probably not even as hard as a wedding because it’s not quite as emotionally wrought, but where we put the most effort into well how do we make it a good conference? And we sort of came up with a list of things, some of which I think turned out to be true. Like getting good speakers, making sure that there’s at least a certain amount of diversity. I think we always want more, but there needs to be at least enough that people can kind of go, look, hey, there’s someone like me there. I was big on having good food. I think that wasn’t as important as I thought it was. It’s important to me, but the things that people cared about it, we’re actually different than what we thought. So there was definitely things that we learned from the process, but the process of getting it organized—and a lot of credit goes to Shawni for being an amazing organizer of things—but the process of getting it made, while stressful and hectic at points, went off pretty smoothly overall. TODD: Yeah. So that’s all true. One thing we did do though is as a leadership team, is we decided to put a decent amount of resources into it. I think a lot of people are like, this is a little side project and it was a side project for us. But we’re 26 people, so we can put a little more wood behind the arrow of a side project like this if we decide to. And we’d probably put a little too much resources in to it, to be honest. And we’ll talk about this later, but the results were well worth it. JAMON: Yeah. One of the things you have to remember is back in 2016 when we were first starting to do this, we had been doing React Native for a year. We weren’t necessarily quite as well known back then, we were still fairly new player in the space. We had done some things in other technical realms that we were more known for, but React Native we were still a relative newcomer. So for us this was, it was a bigger, maybe bigger deal than just necessarily putting on a conference for the revenue or something along those lines. We wanted to be connected. We want it to be in that space. And so we did put it, as Todd said, we put a lot of resources behind it. We put a lot of thought into it. As a founder team, we put a lot into it. TODD: And it was probably a half of Shawni’s main job, which is a significant amount. JAMON: Absolutely. And another person I’ll point out here that who was instrumental was Gant Laborde. He’s typically the most active in the conference circuit from Infinite Red and he’s been to a lot of conferences as both speaker and attendee and he had a really good sense, good instincts about what worked well at those conferences and what didn’t. And early on I read an article about how you should really treat your speakers well and I brought it up to Gant and he absolutely agreed with that. The speakers are so key to a great conference and so we spent a lot of time, energy, and money, making sure that the speakers felt comfortable, that they had a good spot, that they were well supported all the way up to the conference and that was definitely time well spent. It was a good investment. All of the speakers that we’ve talked to felt like they had a fantastic experience. Some said that it was the best conference that they had ever spoke at, which was, a lot of them were very accomplished speakers so for a first time conference, we felt that was very good. TODD: That’s a good example of making decisions that produce good quality products, whether they’re a conference, software, whatever. A lot of people read those articles. The article says the most important thing is treating your speakers right. They read it, they think about it, they talk about it, they don’t actually do it. We accept that we knew nothing about throwing a conference, so we took Everyone-on-the-Internet’s advice like that very seriously and we asked our team and then we put resources behind that and we went way out of our way for the speakers. I’ve spoke at conferences and it is true. Some are very well organized and you feel very comfortable and it makes for a great presentation and some are not. So I definitely think the number one lesson we learned, spoiler alert, was treat your speakers well. CHRIS: Todd, I have a question for you in terms of a follow-up. When you are reading these articles and they say what to do, what is the difference between just reading them and not acting on them and choosing to act on them? Was there just a moment where you’re like, okay, we’re actually going to do that? So we try to avoid that. I mean, I’m not just, it sounds like I’m just cheerleading the leadership team, which is kind of self-serving as I’m on it. But it’s not just us, it’s just the whole team. When we say we decided, Jamon read this article, a bunch of people have talked to agree with this concept of treating speakers well. We’re gonna treat speakers well. The team doesn’t roll their eyes and go, “sure.” The whole company culturally said we’re going to do this and they’re going to do it. And truthfully, the leadership, we helped the decision-making but we didn’t do much of the actual work for the conference. KEN: I think there’s conferences where their idea of treating speakers well is to just throw money at them. And that was not … I mean, I don’t think that’s the feedback we got from speakers. I mean everybody likes money. I mean don’t get me wrong, but it’s about making their experience smooth because no amount of money will stop the nerves or the feeling of not being appreciated. TODD: If you make it easy for people to shine, that’s what they remember. People remember the way they feel about things way more than they remember what was said or the logic to it. CHRIS: So when you’re doing something that’s outside normal business parameters or normal business operations, how does something like putting on a conference cause distractions or disruptions and how have you worked through it as founders and how have you seen the team work through it as well? JAMON: That’s a great question and I think one of the early pain points was just in process because … we’re a consultancy and so we have a certain process that’s set up for clients. And in this case we didn’t have a client. We had an internal project, we had an internal champion, Shawni, but it’s still a very different feel. Shawni wasn’t handing us all of the requirements and saying go build this thing. We had to do it as a group, so we had to develop processes around that and that was something that was very interesting that took time to develop and in fact, we’re still kind of working through some of those things, but I feel like we’ve learned a lot and there’s a lot more shared understanding around how we make those decisions and things like that. So I think process was a pretty big adjustment for us. Another thing that comes to mind with that is allocating actual team time as a consultancy. If anytime that you’re spending on that, you’re obviously not billing and you’re not making revenue for the company. Obviously the hope is that the conference pays for itself by the revenue that comes in for it, but we still had to put a lot of time in on speculation that this was going to work. That’s a very different thing than: give us a deposit and we’ll start working and we’ll send you bills. Again, internal allocation of resources was another adjustment that we had to make and also planning for the future and making sure that we had the revenue, the cash flow to make that happen. And Ken was really good at kind of identifying what we could sustain and what we couldn’t as a company. KEN: Part of the initial “should we do this” consideration was like okay, how many people would we need to do to break even? And we were prepared to be happy with break even and that turned out to be a smaller number than we thought. That made it something that we could grapple with and be like okay, if we can get 150 people into a room where, we think we can do that even if we have to go and individually invite 300 people in order to get that hit rate or whatever. And so it ended up being a lot more than that and that was awesome. But it gave us this margin of psychological safety when we went into it. It’s kind of like, okay, yeah, we can do this, and we know at what point were losing money, what point where we’re making money, at what point we can up the experienced because we’ve got enough margin to do that. TODD: That’s super important. What Ken just mentioned is any time we have an idea we go to Ken and say the main thing is what’s our worst case scenario goal to make this viable? That helps us make a decision whether or not it’s even a good thing to even try. Because obviously if it was 2000 people we’d be like probably not going to do that. You can tell me Ken, but I don’t think it’s super accurate. You do it for a couple of hours and come back and tell us what. Is that correct? KEN: I can’t predict the future. I don’t actually know exactly what’s going to happen, but if you can give it enough margin to be like, yeah, I think we’d be safe at this point, then you can usually get to a model like that pretty quickly. TODD: I’m a little confused, to be honest. When we hired Ken, Jamon, he said he could predict the future. JAMON: Yeah, this is a little concerning. TODD: The weird part is Ken was here before Jamon and our companies merged, but doesn’t matter. It’s time travel. So anything’s possible. Just watch Star Trek. Knowing kind of the base goal gets us all a point to reach to. And then going back to Chris’s question, how to get from 0 to 1, which is actually a very difficult problem. If you’re an engineer, it’s very difficult problem, if you’re building a company and is just a very difficult problem period. But having a goal and then determining at least the first step direction and then you can see if it’s kind of leading towards that goal is very helpful for taking that first step. I do want to mention something else, as well. We did put a lot of resources. We have a tendency sometimes to put too much resources because we’re designers and because we’re software engineers, we like to build things and so we put a lot of resources into our app that was used for three days. We had beautiful design done and that kind of stuff. Not to skip ahead, but we’re re-doing the conference this year. We thought, well, we could just reuse a lot of our designs and stuff and just change it to 2018. We didn’t do that. (laughter) We decided to redesign the whole thing again because we just simply can’t help ourselves. JAMON: Yeah. And going back to the concept of if it’s only 150 people, I think that was our initial number. It rose a little bit later because we had some additional expenses, but if we only had to sell 150 tickets we could literally go and individually pitch people and say, “Hey, come to our conference,” and try to sell them tickets. And we kind of actually did that in some ways. We went to our community, our Infinite Red Community Slack team, which is community.infinite.red and if you’re listening to this podcast you should definitely join it. And we went through and kind of just said, hey, have you heard about our conference? Is that something you’d want to look at? Individual direct messages, individually crafted. We weren’t trying to like spam everybody, but it was just more, let’s get the word out there and the response from that because we had built a lot of goodwill with the community up to that point by helping them a lot of times with React Native problems and by releasing open source and doing all the things that we do in that community channel that a lot of people don’t realize. We had built a lot of goodwill and so the response was amazing and we were able to, in my opinion, just through the community Slack efforts that we were doing, probably sell that minimum number of tickets. We had obviously sold a lot more than that, but that was more additional beyond that. So it was definitely a factor. Well we at least know that we can go sort of virtually door to door and say, hey we have this conference. Hey, do you want to come? CHRIS: What’s interesting is like you’re painting this picture that everything worked out perfectly. There were no hiccups in the process at all, and so what popped up as you’re going through that was like, oh my gosh, didn’t anticipate that one, or was it all just perfect? KEN: It really was pretty smooth. We were a little surprised by that. Some of the feedback that we got, we definitely overdid it on the food in some ways. That what people want from food is like fast and convenient and not terrible and we went for good but somewhat inconvenient and nobody wanted that, really. I mean they were like the food is good, but this was a pain in the neck and that was a pain in the neck, so that was something that we screwed up. That was partly my biases to be honest. I take responsibility for that one, but in the run up, in the planning, there wasn’t a ton that really went wrong. Right? We didn’t get major speakers bowing out. The things that we’ve heard of going wrong at conferences. To some extent we may have just been lucky, but there wasn’t a lot of disasters along the way. There were things that we didn’t do as well as we could have done, but we didn’t get major disasters. JAMON: Yeah. And obviously this is from our perspective, Chris. And Shawni and Gant and some of the others that were more deeply involved in the process may have other perspectives and I think that—no promises, but maybe this isn’t the only podcast we do here at Infinite Red and if there is another one, then maybe the team can share some of those more kind of operational things that happen—but certainly from our perspective, it went super smoothly. There was an energy to it and things did kind of align. I do think we probably got lucky. We probably got lucky in a lot of ways and the timing was right and the mood was right. Everything seemed to come along pretty well. KEN: And Shawni worked really hard. I’m really trying not to swear so that Chris doesn’t have to edit me as much this time, but Shawni worked really, really hard at the end of it. So a lot of it was that, to be honest. TODD: Yeah. I want to do a quick couple of shout outs. Shawni worked really hard. Gant was our emcee, he’s amazing in front of audience. Frank Von Hoven, which is one of our intermediate developers, he has a background in stage, which we had no idea and he ran the stage like a clock and he took care of all the backstage stuff, getting the speakers set up. It was amazing. That was just serendipity. You don’t just happen to have that person. So I do want to shout out. There’s more people we can shout out later, but yeah. JAMON: And I do want to give a shout out also to the Armory - The Portland Center Stage. It’s a great venue and they did an amazing job. They made our lives a lot easier. There were a lot of things where we could just kind of pay them to do it and they did a great job. That was definitely a good find. Actually, Jason Brown who lives in Portland, a developer who I have been connected with for awhile, he was the one that recommended the Armory and it was a great choice. TODD: There were some things that went wrong. The food was good, the situation and how it was served and stuff was a little bit problematic and stuff. And we learned from that. So that was a problem. TODD: It was a little bit our caterer’s fault (laughter), but I won’t go into that. Another thing is we really tried to take the time to do a proper code of conduct and we are really going to enforce it and we took a lot of time and I think we did a pretty good job. We gave numbers out to text, if there’s anything people to approach, if there’s any problems. The snafu was we forgot to actually put a link on our website to it. So, that’s just a really minor little thing. Another problem of course is resource allocation when you have a bunch of client work. So we had our internal people, who aren’t designers or developers working on it and that’s just carving off a section of time for them, but we also needed our designers and developers to do work, which means they wouldn’t be doing client work. And so sometimes there was resource allocation issues where someone was really busy with a client project and so that’s very challenging for a company like ours with the people you have to bring off the field. And then the last thing I would love to talk with everyone is we did have a little debate and issues around do we have our whole team there. We’re 26 people. It’s basically going to be a week. Do we have our whole team attend? Do we make our whole team attend? Do we ask them, do we have volunteers? What do we do? So that was one of the most challenging things in my opinion. JAMON: Especially since we’re a remote team and some people are going to have to fly from Florida or Toronto or all over and so it wasn’t just a matter of hey, you’re here in Portland, can you make the drive down to Portland? But yeah, that was an interesting thing and I think that it speaks to how much we really cared about the experience of the attendees and the speakers that we did bring most of our team. There were a few that couldn’t make it, but most of our team did go and we had roles for them. That’s actually something we’re going to I think we’re going to do better this year where we’re going to actually provide some training for our team. Some expectations around how they’ll work and stuff, but they wore a specific T-shirt so people could identify them. They weren’t just necessarily venue people or volunteers or something. They were actual Infinite Red employees and I actually feel pretty strongly about that representation because this is representing us to the broader technical community in a very strong way. JAMON: And by the way, quick shout out to React Native. We were able to deploy a very quick update to our app to get that URL on there and have it working. TODD: Yeah, I think it was the app it wasn’t on. Not our website. JAMON: And we’re able to get that deployed in a hot fix. That was very cool. So we did stress that we made that very much a centerpiece and we were very, very happy that there were no incidents that were reported or anything like that, which was nice. JAMON: This is our CEO crawling under the stage to get a photo. TODD: Yes, but what’s very cool, I would go, well, what do you think of the conference? And they would tell me the truth because I’m just the photographer. And that was actually kind of cool. CHRIS: That is pretty cool. And now that you’ve blown your cover, it’s not gonna happen this year. CHRIS: Jamon you touched on the fact that Infinite Red is a 100 percent remote company putting on an in-person event. What kind of challenges went into making this event happen as a remote company? JAMON: We cheated a little bit in that we held it in Portland, which is where half our team is. But I will point out that our primary champion of the project lived in … Did she live in San Diego at the time or was it Reno? KEN: She moved from Reno to San Diego while planning it. JAMON: So this is happening. She wasn’t there to look at the venue. We sent some people in-person to the venue from the local area. And then we also flew Derek up. So this was I think it was actually Todd’s idea. Did you come up with this idea, Todd? TODD: Did it work out well then? (laughter) Then yes I did. JAMON: I think it actually did. TODD: Then of course it was my idea. JAMON: Talk about Derek’s experience there. TODD: This is an example of putting proper resources. Derek Greenberg is one of our senior engineers, which from a business standpoint means one of our most expensive engineers, but he’s a super foodie, kind of like Ken. KEN: He’s way beyond me. TODD: He is beyond you. And Derek is a wonderful, wonderful, wonderful chef. I’ve been at his house multiple times and him and his lovely family hosted me and served me ridiculously good food. So he was the obvious person to choose what food we had. Now, the question is there’s a lot less expensive people. That’s horrible to say, but true. And Derek does not live in Portland. He lives in the San Francisco Bay area. So anyways, well we sent him up for, I think a day or two, and he went around and tasted all the food. And then typical Derek-style, he gave us an extremely detailed information about it. And that’s how we decided on the food. KEN: Amazing, he had the entire company hanging on his every word as he lovingly described this experience. It was actually pretty amazing. JAMON: I’m going to see if I can dig up the description and we can link to it in the show notes because I kind of want people to see this. TODD: If you listened to our previous podcast, we talked about this a little bit. This is one our core tenants of Infinite Red is find where people shine best and don’t judge them for things they do poorly. Judging a dog by how well it climbs a tree is not an appropriate judgment for a dog. KEN: Carve the hole to the fit the peg. TODD: Yes. Now none of us are the dog in this scenario. Well, just to be clear. But anyways, having Derek do that, finding out that Frank has stage experience, of course he’s going to be there being the stage manager and that kind of stuff. We have such a cool creative team that have so many different personal hobbies. We really had a grab bag of awesome resources. It’s really amazing. JAMON: Even Derek with his incredible attention to detail, one of the things he brought up in one of the meetings was that he was very concerned that we make sure that there isn’t garbage around during the conferences, very clean. That we make sure that we keep the garbages emptied and stuff like that. So we made sure, I think with the venue staff, that that was going to happen. So just little touches like that I think go a long way and the team really stepped up to it. They took ownership really of the conference in a way that was maybe a little surprising even. KEN: This is yet another benefit of hiring a team with with what we call nontraditional backgrounds, is that you end up with this much more interesting diversity of life experience and talents and skills, and it enables you to do things that you weren’t originally planning your company to do. It’s awesome. Honestly, it creates this opportunity for serendipity that is harder if you’re full of Stanford CS grads. JAMON: Nothing against Stanford CS grads of course. KEN: Nothing against Stanford CS grads. They’re awesome, right? But any monoculture is going to have that issue. JAMON: Like Frank’s background, I think Frank was in sort of a corporate America. He has an MBA and his background, he’s done a lot of, like Todd mentioned earlier in the podcast, he’s done a lot of stage work and performances and things like that. And he actually started coding fairly late. Well he had, he had been coding when he was a teenager and stuff, but he wasn’t coding professionally until much later in life. So a lot of times you look at someone who maybe switches careers like that and they’re kind of behind in some ways in the technical realm. But what is amazing about that is that they bring all of these other outside experiences and skills to our industry. We kind of need that. KEN: That brings up a really interesting sidebar about career changers, who I think sometimes have a hard time breaking into tech because everybody wanted a cheap person straight out of college or not even college. I think we found that the career changers, the later quote unquote juniors, although it’ll take them a little while to ramp up, but once they ramp up, they can accelerate. Once they hit third year, they can pull ahead of a regular junior junior because of all those other experiences that come to play. KEN: She had a math degree and she worked as an analyst I think for a paper company for a couple years before taking a coding class and people love to rag on the coding classes. But to be honest, if you’re good and you just need to learn to code, they’re great. It’s a very efficient way of doing that. TODD: This is totally off topic, but we’d look in nontraditional areas and we find sometimes overlooked people who are truly awesome and frankly, I’m glad other companies are blind to this. JAMON: Well, this is a reflection of certainly Todd and my background. Ken came from a little more of a traditional path in that way. TODD: Just a whee bit more? JAMON: I’m Jamon Holmgren and I did not go to Harvard. I worked in construction. I have a thousand hours on heavy equipment like dozers and excavators and stuff. Most people probably don’t know that. I spent a lot of my career packing boards in construction sites before I started working in technology and so I was certainly a career changer and I think Todd, you had that experience as well? TODD: Yeah, a little bit different. I started professionally programming at 25, I think. So I did not go to school for it. KEN: Well, it helps that my own father was a career changer. He was physicist, meteorologist, like an academic meteorologist, and just kind of found his way into programming. A, I have some sympathy for that track, but B, honestly my experience with elite institutions also showed me that there’s plenty of people at elite institutions who are not that good. It’s actually no particular guarantee. It’s not, as a gating factor, it’s not all that. And when you take into account how much competition there is for those elite people, it just makes sense to look harder. TODD: Just to clarify, we really don’t discriminate against elite people. We just don’t stack the weight on that side of the scale. CHRIS: Ken, I have a quick question? You said your Dad was an academic meteorologist. Did he have a stage name for like all meteorologists? Like Jackson Hale, or something like that? KEN: He wasn’t a weatherman. He just had, he just had a degree in meteorology. TODD: Jackson Hale. That’s comedy gold right there. CHRIS: Bringing it back to Chain React a little bit. So was the conference worth it in terms of the investment that you put in and if so, what will you do differently this year? TODD: I don’t know financially if the ROI was worth it. Ken can talk to that because we’re a consultancy that does a lot of development in React Native, even if we lost money on it and Ken can talk to that, it would still be worth it as long as we didn’t lose too much just for the marketing, the goodwill and the branding part of it. I feel we ended up selling out, for example, we never told the end of the story. JAMON: We actually did not sell out. I think we got close though and we certainly almost doubled our prediction, so that was a really good thing. This year we probably will sell out. KEN: They all look like NASCAR drivers. JAMON: That’s actually a good idea. I’ll send that to Shawni. KEN: Financially, it worked out fine. I don’t think we ever are going to treat it as a massive profit center. I think the more money we’re able to make, most of that we want to pour back in. We do have to account for our own opportunity costs as well as direct outlays, but I think we’re fairly confident that we can run it that way. But I would say it was a success, sort of all the way across the board. We’re not doing that much different. Like I said, we’ve tweaked the food. We’ve dropped a couple of things that no one seemed to care about. So like the social, nobody wants to stick around for the social. They just want to go out and interact socially with the people that they’ve met or the people that came with or whatever. And so we just gonna let them do that and not waste money on that. But I can’t think of anything really big that we’re doing differently. Can you guys? TODD: I want to make one quick comment about the social. The cool thing about the Armory in Portland is it’s smack dab on a street where you can literally go across the street to good restaurants. You can go down two blocks to good restaurants. So in that scenario, at some conferences I’ve been to, they’re kind of out in the middle of nowhere. So you definitely want some social events. But in this case everyone wants to go out. KEN: Yeah. For those of you who know Portland, it’s in Pearl District. For those of you who don’t know Portland, it’s one of the best sort of visitor friendly walkable neighborhoods in the country, not just in Portland. I mean it’s a really, really great neighborhood and that helped. And so our little catered thing probably was not as exciting as the other opportunities out there. TODD: Now we did have a sponsor, Squarespace, who threw a before party. And that was actually a lot of fun. So that’s the caveat on that. We’re just talking after, I think the first day we had a social immediately after the conference. JAMON: I think bringing it back to the financial side of things, I would actually, from what I looked at, I would actually consider it a financial loss. Maybe if you just look at hard expenditures, we were probably in the black, but we also spent a ton of time and if you look at opportunity cost, we probably lost money on it. That again, like what Todd said, it wasn’t necessarily the focus of what we were trying to do as far as making a profit center. And I think there’s a little bit of a perception maybe in the tech industry that the conferences make tons of money. I don’t think that’s the case. If you think so maybe you should make a conference and see what you think. But at the same time, part of that was due to our refusal to kind of let anything be substandard, we kind of overdid it in a lot of ways. I think that this year we will probably sell more tickets. We have some things figured out already. We’ve sorta refined what we’re doing. We might actually do okay on this year, but we’re also giving more concessions to the speakers and things like that to try to make it easier for them. So there’s a little bit of a mitigating factor there too. TODD: Yeah. Even if it didn’t make an actual profit, that’s not super relevant to me. I think the return on investment is many fold. CHRIS: Looking into the future, how does Chain React and starting your own tech conference, create a model or framework for maybe future ideas or big ideas that you might want to accomplish? TODD: One thing it did, because we’re a consultancy, because we do client work, we have that process down pat. We’ve redone that process over the years many times and keep on refining it. Internal projects for us is challenging. We don’t do that very often, so this is our very first big internal project, so purely as a training or a learning device for our team it was awesome for them. KEN: The first big project that isn’t an open source project. JAMON: We actually regularly point to Chain React lessons and experiences when we’re talking about other internal projects. It’s actually been really good as a reference point. Do you remember this with Chain React? You remember that with Chain React? And it kind of gives a reference point for other internal projects. It exposed certain aspects of our team that we hadn’t really considered before. Because it was such a different thing. I know that we as founders had a meeting after Chain React and talked about some of the lessons learned from that and I don’t think we’ll necessarily go through every last little detail of that, but it was very kind of eye opening to us about the way that we had structured Infinite Red. 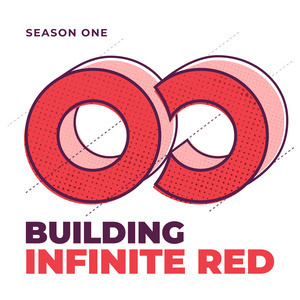 The title of this podcast is Building Infinite Red and I think that Chain React was a key forcing mechanism within Infinite Red to expose some things that we hadn’t been exposed to before. If we just did consulting work, you tend to get some blind spots. So Chain React was amazing for that. It was really, really good for that because it was so different from what we had done otherwise. TODD: Worse case scenario, the team had a lot of fun doing it. KEN: I think that’s Shawni’s favorite memory. JAMON: Thanks a lot, Ken. JAMON: When Chain React was over, I think half the team went to a nearby restaurant and we were all exhausted. We had been up for two days just working from pre-dawn to dusk and there was kind of this feeling of let’s just go get some food to eat and let’s collapse into bed. We went to a restaurant and we sat in this booth and there were probably, I don’t know, nine of us, 10 of us, something like that. And some spontaneous kind of reflective conversations started happening that were just amazing. One of our developers said, this is nothing I expected signing up at Infinite Red. This was an incredible experience to be involved in this. JAMON: Kevin was was certainly on those same vein, but the person who actually pointed this out was Frank and I remember that very clearly. His wife was able to come and help us with the conference. It was really great. TODD: Cedric was awesome for a 12 year old. It was amazing. JAMON: Yeah, he’s a good kid. And he helped out. He was great. He would talk to people, he would give them directions. If someone needed someone to run and get something. He was very on top of things and he was there at that table as well and kind of just kind of absorbing the vibe. It’s one of my favorite moments at Infinite Red. It was kind of a result of all of the work that we had done and what we had accomplished at that point. TODD: Correct. And Robin Heinze’s father came and did some volunteering and we had a lot of people come and want to help. It was really, really fun in that regard. One thing I would like to bring up is the Armory is a very cool intimate setting. I’m not using that as a nice way to say small. It’s actually not that small and it has a big theater, but it only holds about 500 people, which is about what we sold. So we’re redoing in the Armory this year and so we have a cap on how many people can show up because it only holds 500 people. We actually had a big discussion after the first Chain React on whether or not we wanted to get a bigger venue because we could probably sell more tickets. We decided against that because we sent out a survey to all the attendees. We sent a survey to the speakers and we got some feedback. Everyone loved the intimacy of the Armory. And the Armory, just real quick, it has a bottom floor where we had vendor booths set up. It’s like an atrium. There’s a big hole cutout of the top floor, so the top floor is like a donut. There is a staircase in the middle of the bottom floor that circles around and goes up to the top floor. So we had the whole bottom floor. We had a whole top floor. Up to the top floor, there was chairs, there was the coffee station, an alternative food station when we were serving lunch. And there were some vendors out there as well. Even if you were on the second floor, you’re always in this room where all the action’s going on. You could look down and see people. So although it’s large enough to hold 500 people, which is a fairly large area, you can’t put 500 people in a very small area. Fire marshals am I right? Because of the structure of it now and then you left that room and went into the theater, which is more like a traditional theater, like a movie theater, but it was course has the stage and stuff because it’s for presentations, but when you weren’t in the theater you were always within earshot and always within line of sight to everyone in the conference and so although it was 500 people, it felt like there was 20 people there and I personally got to talk to at least half the people. Anyways, long story short, it was a big decision to say no. We want the feel of the conference to be the same, so we’re going to cap on how many people we can attend, which does affect finances and that kind of stuff. Obviously when you scale higher, all of the little expenses get smaller and it’s always better financially to be bigger than smaller.